Bishop's Boxers: A Chicago, Illinois boxer breeder committed to excellence and ethics in professional boxer breeding. We provide quality boxer puppies to the Midwest and Nationwide. Welcome to our blog! If you are a computer, be sure to turn up your speaker volume so you can enjoy Boxertunes while you browse our site. We are a boxer-loving family that recently retired from military life and relocated to the Chicago suburbs. 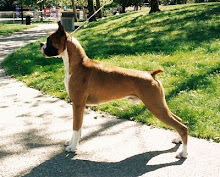 Our love for the breed began back in 1987 with our first boxer in Minnesota. Although he wasn't the most beautiful boxer, Chesty became extremely well-trained. Unfortunately, in 1998, he got cancer and we had to put him down when he was nearly 11. Knowing that we didn't want to experience life without Boxers, we had a new puppy waiting to be shipped from Crossroad Boxers in California to Minneapolis, Minnesota. We gave this striking 8-month old fawn male the name of Bishop. Little did we realize that he would be the beginning of our own kennel, Bishop's Boxers. Bishop participated in many dog shows while we had time in graduate school, but then came children and active duty military life. Having the desire to have a puppy from Bishop and the determination to uphold and improve the standard of the boxer breed, we bred Bishop and got our first female, Lady, in February of 2005. Lady produced two wonderful litters of puppies with Telstar's Dixieland Band (Bandit). Telstar Boxers continue to be a large part of our pedigrees. We lost Lady in August 2015 to Cushing's disease. It never gets any easier. We kept one female puppy from Lady's first litter, Eve. And from one of Eve's litters, we kept Latte, a classic fawn female. We update our blog regularly, so be sure to check back here or on our Facebook page for the most current information. This is a strong bunch of puppies, and they are already on the move! Here is the first of many Puppy Cams. Our first boxer Chesty. He wasn't the most beautiful boxer, but certainly well-loved! We believe that first impressions are of utmost importance for both prospective buyer and breeder alike. When emailing inquiries, please include information about yourself so we can begin the interview process for puppy placement. For information and availability of Bishops Boxers AKC registered show and pet quality puppies from fully health tested and selectively planned breeding, please contact Beth at bishopsboxers@gmail.com. © 2017 Bishop's Boxers. Images may not be used without written permission of the Owner. Picture Window theme. Theme images by andynwt. Powered by Blogger.